Are you interested in coaching or volunteering with RPW? We are excited to begin preparing for the 2019 season! We are currently looking for Head Coaches and volunteers for many positions. If you are interested, please email riversidepopwarner@gmail.com or call 951-241-1722 for more information. 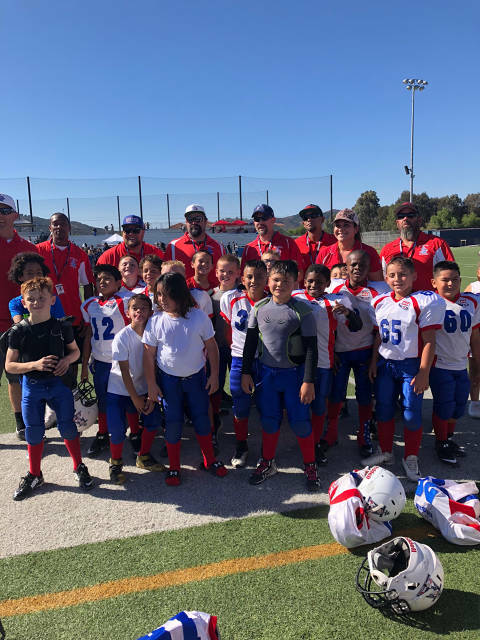 Congratulations to the Mitey Mite Patriots for their 16-26 win over Escondido in the Semi-Finals yesterday! Good luck in the Championship game! One more win, and they are headed to Hawaii! Come show your support Saturday, November 17 10:00am at Montclair High School. Congratulations to the JV Cheer Team for taking 1st Place at the Mt. Baldy Cheer Competition. Good luck at Regionals! We are proud of you! Come out to the Long Beach Convention Center Sunday, November 25 to cheer them on! OUR MAILING ADDRESS & PHONE NUMBER HAS CHANGED! It is time to begin planning for the 2018 season. We are pleased and excited to bring the 2018 Pop Warner Football and Cheer season to the beautiful city of Riverside. We welcome back the outstanding football players and cheerleaders, and we are gladly accepting new participants to RPW. We will begin providing FREE football & cheer skills and drills clinics open to all boys and girls ages 5-14 on Tuesday, June 5th from 6:00pm-8:00pm at Don Derr Park. These clinics will be held every Tuesday and Thursday evening throughout the month of June. We encourage you to come out and see what Riverside Pop Warner is all about! Please check back often for an update on our upcoming sign ups and events. 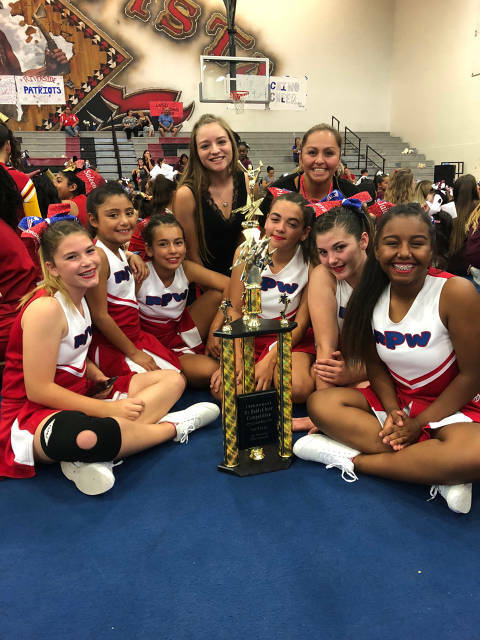 Riverside Pop Warner embraces the POP WARNER philosophy of mixing scholastics AND athletics together. LET'S HAVE A FUN, EXCITING SEASON! Congratulations to our JrPw Bills on their 2015 Mt. Baldy D1 Championship win over San Bernardino Ravens. We are very proud of you! Congratulations to our Jr Midget Patriot Cheer squad on their PW2 Small 1st Place win at the 2015 Mt. Baldy Cheer Competition. Come out to support them at the 2015 Wescon Pop Warner Regional Cheer & Dance Championships at the San Diego State University-Vejas Arena. Sunday November 22nd. Go to http://www.wesconpopwarner.com/Championships/2015regionals.htm for more info. Congratulations to our 2014 Mt. Baldy Conference D3 Jr. Midget Champions the Riverside Patriots!! We are now the Riverside Pop Warner Football & Cheer PATRIOTS! We need Head Coaches for our 2019 Season! Are you interested in volunteering for the 2019 Season?